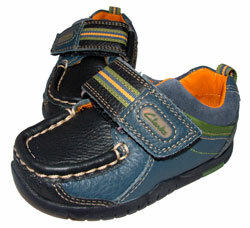 Clarks Softly Boat – row your boat softly down the stream with your little one decked out in these boys’ first shoes. Redesigning the classic mens’ boat shoe and downsizing it for little feet, this suede style comes in navy with grey overlays and bold colour pops to the trimmings. Elasticated lacing and contrast stitch details give a truly authentic aesthetic, while the riptape strap across the instep ensures a secure and comfortable fit. Set on an Extralight sole and lined in soft leather, the Clarks Softly Boat first shoes are an adorable mini-me style for your First Mate.